Built upon UA’s 60-year heritage of audio craftsmanship, Apollo 8 distinguishes itself with four Unison™-enabled mic preamps, UAD-2 QUAD Core processing, and an included bundle of award-winning UAD plug-ins — which you can track through with near-zero latency, shaping sounds like a classic analog studio — without taxing your host Mac or PC. 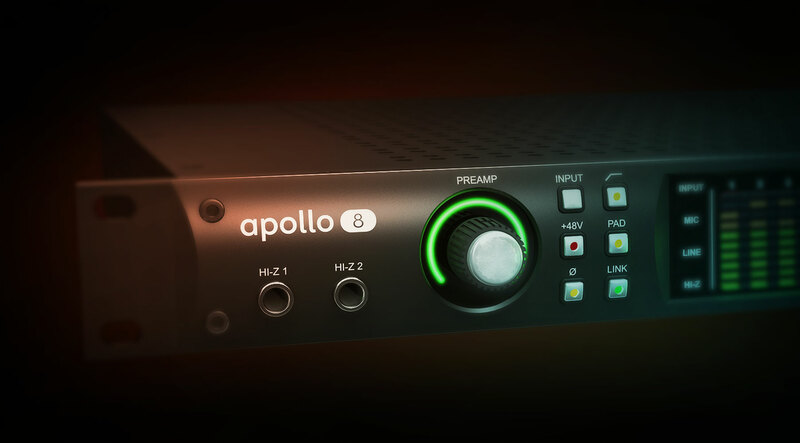 Apollo 8 features four Unison-enabled mic preamps, letting you track through exacting mic preamp emulations from Neve, SSL, API, Manley, and Universal Audio. An Apollo exclusive, Unison technology nails the tone of these sought-after tube and solid state mic pres — including their input impedance, gain stage “sweet spots,” and the component-level circuit behaviors of the original hardware. The secret to Unison is its hardware-software integration between Apollo’s mic preamps and its onboard UAD-2 QUAD Core DSP Acceleration. Simply place a Unison preamp plug-in on your mic input in Apollo Console software, and it physically reconfigures the Apollo interface's impedance — so you can tap into the classic sounds of the world’s most recorded mic preamps. Right out of the box, Apollo 8 provides a suite of incredible analog emulation plug-ins including the world’s only authentic Teletronix LA-2A, 1176LN, and Fairchild compressors, the legendary Pultec EQs, and the Unison-enabled UA 610-B Tube Preamp. Developed by UA’s world-renowned team of algorithm engineers, these Realtime Analog Classics plug-ins set the standard by which all other hardware emulation plug-ins are judged. With Apollo 8’s Console 2.0 application — a complete re-imagining of Apollo’s original Console software — you can take advantage of over 25 new user-requested features such as Channel Strip presets, Drag & Drop functionality, dynamically resizable windows, and more. New for Apollo 8 is Unison technology on the front panel instrument inputs, giving you dead-on, impedance-matched emulations of guitar and bass amps like the Fender '55 Tweed Deluxe, Marshall Plexi Super Lead 1959, and the Ampeg B-15N Bass Amplifier. Tiene todas las herramientas necesarias para un trabajo de calidad. Solo espero que hagan drivers para Windows, me seria muy util ahi tambien. Includes the "Realtime Analog Classics Plus" UAD plug-in bundle. Other UAD plug-ins sold separately. I've had the Apollo 8 quad for a few weeks now. I looked at the owners manual exactly once in order to make the Apollo copacetic with ProTools, which was very simple. My project studio is mostly for editing. I would record at a great studio, take the tracks home to listen and edit, and then take everything back to the studio to mix. With the Apollo, I'm fairly certain I can mix a great-sounding record at home. The playback sounds more "real" like what I heard in the studio. I can more accurately hear panning and tiny changes in EQ. The UAD plugins have been my favorites for ten years, and I've heard about everything in various studios over the last fifteen years. I've also used the real gear. The digital models hold up well and, considering the maintenance costs, lack of mobility, and line noise maintenance introduced by all those analog connections, the Apollo is an incredible deal. I changed my set up recently from the new motu interface 1248 and the Monitor 8. I liked them well enough,,,very open and transparent with no real desire to change until a friend recommended the UAD Quad Apollo. I bought it and hooked it up and came to the conclusion that it is a beautifully designed and SOUNDING interface. Even without using the plugins. The console is well designed and works very well. Again, all of these companies have talented people working for them. I do think that UAD is a notch above as they are really catering to the musical needs of engineers and players alike. Wonderful product. I am new to UA, and I find the Apollo8 quad and the console software a real pleasure. It's got a sense of quality. Bit disappointed at the combi connector. I would rather have all possibilities run to the patchbay but I can't... I have to choose whether I use the mic pre's or the lines. Otherwise i'm crawling around the back. Minor annoyance, but still worth mentioning. I've recorded for years using a Yamaha AW4416 hard disk recorder and liked it pretty well. But I've had an itch to try bridging my world of analog synthesis with Ableton Live. I got the Apollo and Live in the same week and am working to wrap my head around all the possibilities. The ability to use plugins in real time is completely revolutionary to my workflow. I've gone a bit nuts in the UAD store and picked up a slew of plugins. Each is like a magical adventure. Things sound so crisp now and my Mackie HR824s have never been happier! I've also begun exploring the world of lightpipe communications between my Mac/Apollo/Expert Sleepers ES3/6, and modular using Silent Way. This ecosystem is VAST and my Apollo is the centerpiece. Well pleased. Exceptional Sound in particular analog/digital and digital/analog converter - no color ! No fatigue of listening during operation ! Good and stable software integration of UADs console in DAW plus flexible routings from DAW, to DAW, digital and analog ins and outs. Important the option of using consoles recall in every single individual DAW session. Nothing is left to chance. Probably in further releases an automation of console would be appreciated (e.g. vol, balance etc plus plug in functions) !!? The housing of the Apollo 8 is very stable as stable as my two UREI 1176LN which I run for about 30 years. No obvious quality spreads itself in the fact that the device is manufact. in China. Its a thousand times better then my previous M-audio ProFire610. And one of the most important reasons is stability. I really can rely on it in any situation. There is no more sudden desynchronizations, reboots, disappearing of sound etc. It just works as it should. As if I took off the handcuffs. No more fear of crash in huge overloaded projects. And of course it sounds better. What a fantastic piece of equipment. I've been a UAD user for years, starting with the PCI card then on to the Laptop Solo, the Satellite and then the Apollo Twin. I took the plunge to the Apollo 8 Duo (and free Satellite) this month and did my first tracking session with Unison technology last week - the results are the next step and that comes from using Apogee and Audient preamps. As a Pro Tools user i expected AVIDs own Mbox is more integrated into Pro Tools proprietary then third party interfaces, but with the Apollo i got a real latency free recording / monitoring workflow by practice. Parallel handling of completely different routing setups is really handy and easy now - including hardware gear inserts etc.. The same happens in Studio One which i use to capture new ideas which is on a production level now from the first step on. Latency free working - as expected from the MBox - was really delivered from the Apollo in a practical way. I had the previous model of Apollo and I have changed with the new Apollo 8, the first impression is that the quality of sound is better thanks to the improvement of the converters, the old Apollo offers a very good quality sound, is grateful for the new buttons with functions specific on the front of the Apollo which is now more versatile when it comes to record audioalso the renewal of the application Console 2.0 makes the workflow more quick and easy to use, as a negative note saying that the Console application does not support the use of the DSP Satellite Thunderbolt. In short I recommend investing in the new Apollo 8. Tenia el anterior modelo de Apollo y he cambiado por la nueva Apollo 8, la primera impresión es que la calidad de sonido es mejor gracias a la mejora de los conversores, la antigua Apollo ofrece un sonido de muy buena calidad, se agradece los nuevos botones con funciones especificas en el frontal de la Apollo el cual ahora es mas versátil a la hora de grabar audio, también la renovación de la aplicación Console 2.0 hace que el flujo de trabajo sea mas rápido y fácil de utilizar, como nota negativa decir que la aplicación Console no admite la utilización de las DSP Satellite Thunderbolt. En resumen recomiendo invertir en la nueva Apollo 8. At first blush I mistook the brightness of the unit for detail. Unfortunately, the highs and the high-mids are actually pretty smeared. It's hard to hear "through" the unit especially if you are used to dedicated, good, mid-level converters (Apogee, Lynx). In addition, everything below 120z is small and tight and not necessarily accurate, musical nor fun to listen to. Reminds me of the old Motu interfaces: prosumer, studio-project-ish, waiting to be upgraded. In short, I was ready to make the leap but was ultimately disappointed. That combined with the $115 I paid UPS to ship the unit back to Sweetwater left a sour taste in my mouth. I have Universal audio apollo 8. It's a very good device.I recomend it. I purchased the Apollo 8 Quad a few months ago, and recently received an email about replacing the unit due to some upgrade, so we replaced it. However, the new product came with a scratch, and I was really disappointed. UA said they would replace it again for me, so we sent it back and received another interface, but this time, it was not balanced, the bottom tilts and is not flat. I was really unsatisfied and upset, but since I had to travel overseas for a business trip, I just decided to keep this one because I didn't want to go through the trouble again. I am back now, and writing this review. Truly disappointed with UA. Greatest product, greatest sound,I’m a recording engineer for about 40 years. I have 2 Grammy a 6 nomination. I’m work whit protocols HD apogee and I recommend this product. Super love this ! Sounds great ! Also have a uad thunderbolt satellite quad ! Awesome too! The only down side is console can not share dsp from any other device. I did not know that and feel slightly misled. Universal audio apollo 8, It's a very good device if you know what you are doing. no issues or bugs yet!